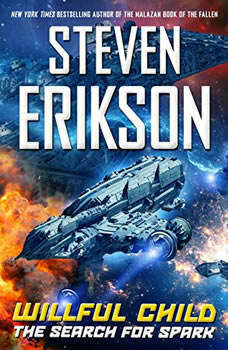 The New York Times bestselling author of the acclaimed Malazan Book of the Fallen series, continues his hilarious science fiction series--parodying and paying homage to exploring the final frontier--with Willful Child: The Search for Spark. These are the adventures of the starship A.S.F. Willful Child. Its ongoing mission: to seek out strange new worlds on which to plant the Terran flag, to subjugate and if necessary obliterate new life-forms.We join the not terribly bright but exceedingly cocksure Captain Hadrian Sawback and his motley crew on board the Starship Willful Child for a series of devil-may-care, near-calamitous and downright chaotic adventures through the infinite vastness of interstellar space.Steven Erikson has taken his lifelong passion for Star Trek and transformed it into a smart, inventive, and hugely entertaining spoof on the whole overblown mankind-exploring-space-for-the-good-of-all-species-but-trashing-stuff-with-a-lot-of-high-tech-gadgets-along-the-way adventure. The result is a novel that deftly parodies the genre while also paying fond homage to it.